Located in the Yvelines, on the banks of the Seine, the Residence CERISE Chatou offers 64 rooms and apartments, spread over 4 floors. A pleasant and practical place where according to your mood, you can work, dine or rest. 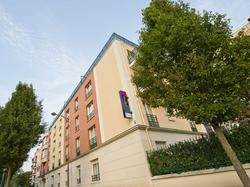 CERISE Chatou is a modern and comfortable hotel complex near La Défense business district. Week -days : The reception is open 24 hours a day. The Residence has a breakfast area. Breakfast is served from 7 to 9.30 week-days and from 7.30 to 10.30 the week end and holidays. Cold continental Breakfast: Sweet Breads, fresh Bread, cereals, jam, plain yoghurt, stewed fruit, milk, butter, Nutella, honey, orange juice. Hot drinks: tea, coffee, chocolat. Chatou is known as the town of Impressionist Country. Located on the banks of the Seine, you can go and visit the famous open-air cafés. Immerge yourself in a place full of history and culture.